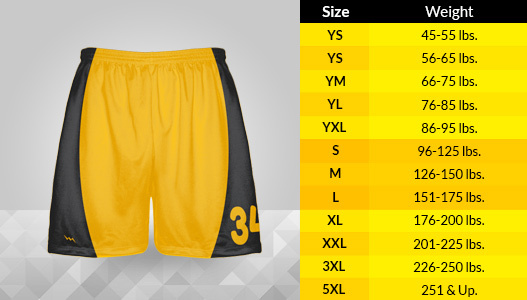 Below is a sizing chart for adult and youth lacrosse shorts. The size length and width are measured in inches. Smaller and larger sizes are available upon request. Please feel free to call us at 888-GET-STRK with any sizing questions or concerns. Custom lacrosse shorts have a 9 inch inseam and our custom basketball shorts have an 11 inch inseam. The shorts come with or without pockets so please specify at time of order. If you are unsure about the size, please call us and we can help you find the correct fit. All shorts are dye sublimated with unlimited color options.